Ida Jew Academies offers 3 academy options to promote student creativity, critical thinking, collaboration, and communication. Its diverse student body comprises 605 students in grades K-8. In 2014, the Mount Pleasant School District established a literacy partnership with EL Education through the Teacher Potential Project to implement EL Education’s Grades 6-8 ELA Curriculum. In particular, teachers learned new strategies and protocols for managing active learning, teaching close reading of complex text, teaching argument writing using evidence, and facilitating rich student academic discussions through strategic questioning. 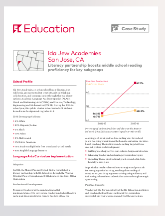 After two years of implementing EL Education’s ELA curriculum, 6th-8th grade students at Ida Jew Academies outperformed their peers across the state by 19.7 percent points on the Smarter Balanced (SBAC) ELA assessment. The percentage of students meeting or exceeding grade level literacy benchmarks increased from 46.3% in 2014-2015 to 67.7% in 2015-2016, a 21.4 percentage point improvement. As a comparison, statewide proficiency increased by 4.3 percentage points. The percentage of Ida Jew students not meeting or nearly meeting grade level literacy benchmarks decreased from 53.7% in 2014-2015 to 32.3% in 2015-2016. EL Education’s curriculum and instructional practices reflect EL Education’s commitment to equity for students from historically disadvantaged communities and for English language learners (ELLs). Post-implementation results from Ida Jew Academies reflect dramatic gains in ELA proficiency for students eligible for free or reduced-price meals and for ELLs. Students eligible for free or reduced-price meals reaching proficiency in ELA improved by 21.6 percentage points from 2014-2015 to 2015-2016, while ELL students reaching proficiency in ELA improved by 26.4 percentage points over the same period. I understand how to implement my state ELA standards better because of this institute. This institute provided me with strategies I will put into practice in my classroom. This institute provided me with ideas on how to improve my teaching. Professional services: Districts and schools that seek targeted professional development and coaching on EL Education’s core practices. Download the PDF of the Ida Jew Academies case study here.